1. Wireless Router Mode: Create an instant private wireless network and share Internet to multiple Wi-Fi devices. 2. 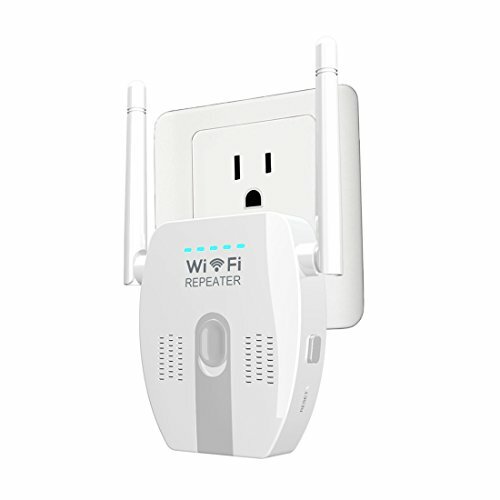 Repeater Mode: Receives and broadcasts your existing wireless signal to extend wireless range. 3. Access Point Mode: Connect to a wired network and transform wired Internet access into wireless allowing multiple devices/users to share the Internet. 4. Client Mode: Connects to another device via Ethernet cable and acts as an external adapter to send/receive wireless signal from your wireless network. 5. Bridge Mode: Connect to an outdoor WISP (Wireless Internet Service Provider) AP to allow multiple devices/users share the same wireless internet connection. If you have any problems in the installation process,please feel free to contact me. HIGH PERFORMANCE: External antennas for better performance, reliable wireless N network speed up to 300Mbps covering your bedroom, floors, restroom, garage and garden. MULTIPLE MODES: Router,Repeater,AP,Wireless ISP operation modes,which is suitable for different network demands. EASY INSTALLATION: Easily expand wireless coverage at a push of the WPS button; or browser-based configuration, accessible from almost any device, including iOS and Android mobile platforms. Smart LED signal indicator helps you find the best location. BOOST WIFI COVERAGE: Boosts your existing Wi-Fi coverage to deliver fast and reliable wired and wireless connectivity, extend WiFi up to 300Mbps,say goodbye to WiFi dead zones. DUAL EXTERNAL ANTENNA: External antennas for better performance, Access Point mode creates a WiFi hotspot using a wired Ethernet connection. If you have any questions about this product by Auxeo, contact us by completing and submitting the form below. If you are looking for a specif part number, please include it with your message.